For families that live on a tight budget or suffer a financial set back such as a job loss, seasonal expenses such as backpacks and school supplies for children can be a hardship. That’s why with support of donors, the Community Assistance Center (CAC) provides free backpacks and school supplies to children of local families in need. Sandy Springs resident Yanet and her family experienced a stressful financial situation a couple of years ago. She took time off from work for surgery and following recovery the restaurant was closing and her job was gone. She and her husband struggled to pay for their family’s basic needs on his income while she looked for work. Then a neighbor told her about CAC. CAC gave her family food and clothing which was helpful for the children going back to school. Also through the generosity of CAC donors, all four of her children received new backpacks and school supplies, saving the family about $200. With backpacks and school supplies averaging $50 per child, Yanet said without the help of CAC she would have likely canceled her cell phone service in order to pay for their school supplies because their other bills of rent and utilities are non-negotiable. “It’s important to us that they have them so I would have made that sacrifice but I probably wouldn’t have been able to meet all of the supply requirements for them,” she said. Unfortunately, children of families that struggle financially often go to school without the necessary tools to learn. Studies show that when kids have school supplies of their own, classroom behavior and grades improve, self-esteem strengthens, and kids develop better attitudes toward school and learning. Once Yanet found another job the family didn’t need further help from CAC, but now she has lost her job again to another restaurant closing, and will be requesting backpack and school supply assistance from CAC this summer. 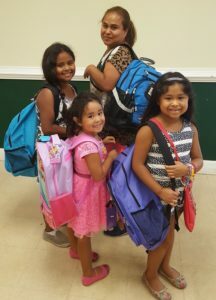 Donors can help provide 900 local children in need with new backpacks filled with school supplies when they give to CAC’s “Tools for School.” Just $35 provides for a child (retail $50 each) as donated dollars go further thanks to wholesale purchasing by CAC! Through CAC’s “Tools for School” donors can chose which school they would like to support and know that each child’s backpack is packed with supplies per their school and grade requirements. Backpacks with school supplies will be distributed at the end of July. 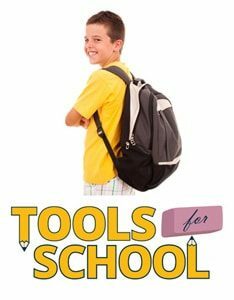 Donations to Tools for School are accepted year-round. CAC also accepts donations of new, heavy large duty backpacks.